Minigore 2 just hit the Play Store! If you enjoyed the first part, you can’t miss the second release! Minigore 2 has come to Android devices as addictive and fun and as it was the original game! 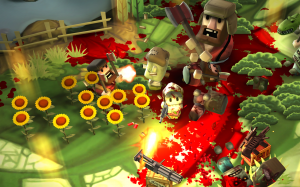 Minigore 2 is a dual stick shooter that was initially launched on iOS in 2009, and now in its second release, it finally arrives at the Play Store. In this sequel, the protagonist must navigate his way through all kinds of zombies and other creepy creatures. 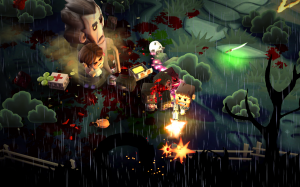 It is a game with cartoony graphics where the blood is the absolute protagonist. In this second adventure, the action is wilder and hordes of zombies relentlessly attack our hero, John Gore. It is a game with virtually no plot, where our only goal is to eliminating everything we see in front, using two virtual sticks that control the protagonist. We will have all kinds of weapons, from swords and axes to grenades and machine guns, and we can choose from 20 different characters, which have to be unlocked as we advance through the game. To improve our equipment, we need to collect the gold provided by the enemies killed, and we can invest it in equipment upgrades and new arsenal acquisition. The improvement process has a degree of randomness, due to the fact that when we choose new weapons, we select closed-boxes, without knowing what we will find inside. To further complicate the situation, the difficulty of the game is not very well balanced, and we will find some very difficult situations if we have not gone through the in-app purchases to buy some new weapons. This feature, along with the lack of variety when playing, is the two most criticized points of the game. However, if you liked the first release of Minigore, you can’t miss this sequel. You can download it free from the Play Store. If you have an iOS device and you did not know this game yet, you can download it from the App Store for $2.69.